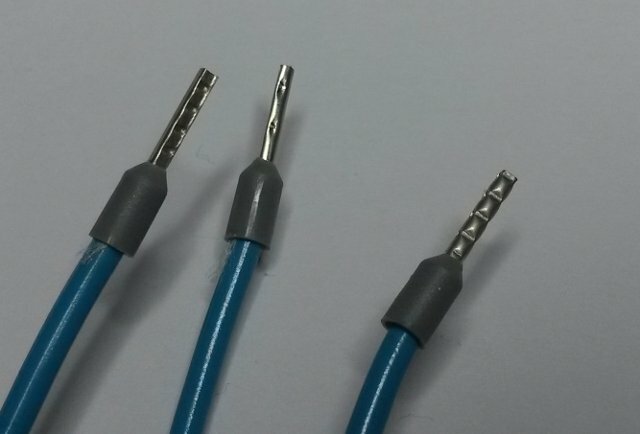 Wire Ferrules (sometimes called Cord End Sleeves) allow the easy and reliable connection of flexible leads to screw terminals. Ferrules are the preferred alternative to twisting wire strands or tinning the wire end (tinned ends should not be terminated in compression clamps). Industrial best practice is to NOT tin wires that are to be terminated with screw terminals. Ferrules ensure reliable electrical connections when terminating stranded flexible wires in terminal blocks, circuit breakers or other control devices. They prevent fraying and breaking of individual wire strands. The individual wire of the script leads are held together by the wire ferrule that is crimped to the wire end with suitable crimping tool. In factory automation (PLC) and distribution boards the wires are systematically terminated with bootlace ferrules that are carefully crimped onto each wire end. These ferrules allow for multiple re-connections without undue damage to the wire end. To add those wire ferrules, you need the wire ferrules and crimping tool. Ferrules are available uninsulated and insulated with color coded plastic sleeves. In generally prefer insulated versions as the color-coded insulation protects the crimped connection from contacts. Wire ferrules are available in many sizes. Technical parameters of the wire ferrules are defined in DIN Specification 46228, Part 4. 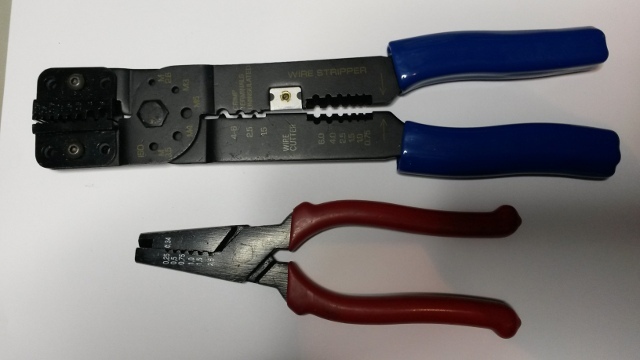 Here are two crimping tools I have used. The crimping tool on the bottom of the picture is the oldest wire ferrule crimping tool I have (lets call it tool A). It came with a cheap a cheap set of non-insulated wire ferrules. This tool was cheap, but the quality matches the price: not very good. I was not satisfied with it because the crimps were too often bad quality. The tool was designed to have blade on the tip to cut wires, but it does not do that well either. I needed something better. The one on the up on the picture is a newer one (let’s call it tool B). It has KELY brand on it. It makes considerably better crimps than the cheap one. This one is useful crimping tool, but not ideal. The good thing is that this has some extra functionality like wire stripper, wire cutter, uninsulated terminal crimping tool and small screw cutting built into it. In this picture the one on the left is made with crimping tool B. It looks and feels pretty solid. The crimping shape looks almost like trapezoidal crimping. The wire on the center was crimped with tool A. It is hard to say what is the exact shape, because it is not well defined. 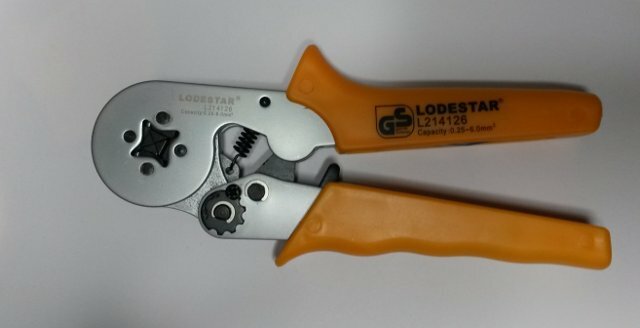 LODESTAR L214126 Ratchet Terminal Crimping Pliers Tool – Yellow is reasonably priced (less than 25 USD) wire ferrule crimping tool. It makes better quality crimping and is nicer to use than cheaper tools. The best feature for using it is that self-adjusting adaptation to the desired end sleeve (ferrule) size: no wrong crimps caused by using the wrong die. The tool has a ratchet system ensures crimp cycle is completed before releasing. Just put in the ferrule and crimp, works every time without problems. The crimp shape is square crimping for optimum contact areas in the clamp connection. This is a very good wire ferrule crimping tool. It crimps the ferrule from all four sides. The tool feels solid on hand and the crimps are very good. Just install a ferrule over a stripped wire and insert it into the opening, and press. Works like the really expensive ones, except that price reasonable. Exact crimping force adjustable of you need to do that (I was happy with the factory default). This is one of the best wire ferrule crimping tools I have used. The tool covers wire sizes from 0.25 mm2 to 6 mm2. 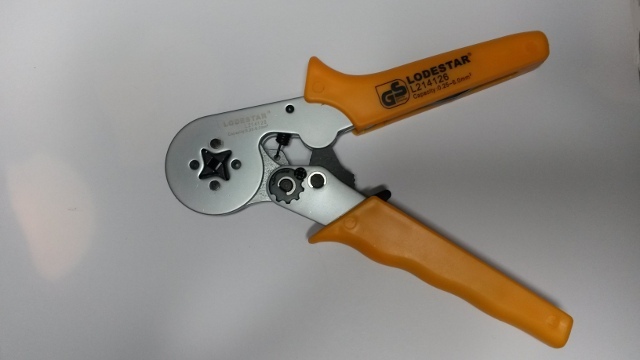 At LODESTAR L214126 Ratchet Terminal Crimping Pliers Tool – Yellow page there is a customer review by KLB01 that says that this tool professionally useable but the quality is not compareable to the ten times more expensive ones. I can agree on that. The same customer review says also that the tool can be disassembled for cleaning or maintenance.This is very fairly priced for a good quality tool. the adjustment wheel on this crimpers what are the wire gauge setting ? The adjustment wheels provides some control over the maximum pressing force the tool puts to the ferrule. Basically the tool is auto-adjusting – meaning you just put in wire with ferrule and press, and get good crimping without any adjustments. If for some strange reason you have some problems (for example some specific ferrule made if different material needs more or less than normal force), then there is adjustment you can try to correct the situation. In my case I have never changed the default settings to anything. Thing have worked well from 0.35 mm tiny ferrule in tiny signal wire to ferrules up to 2.5mm2 mains power and speaker cables without any adjustments.